The event raised more than $27,000 to support Candlelighters For Children With Cancer. 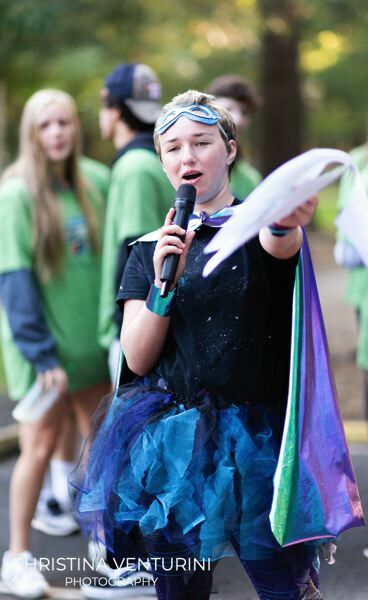 A 15-year old cancer survivor and Hillsboro resident helped emcee the sixth annual Superhero 5K Run/Walk to benefit Candlelighters For Children With Cancer on Saturday, Aug. 18. With help from Hillsboro teen Erin Morrison, the event, held at Cook Park in Tigard, raised more than $27,000 to support the local nonprofit which helps families battling childhood cancer, said director of special events and partnerships Jennifer Jones. "It was such an honor to be part of the Candlelighters Superhero 5K this year," Morrison said. "As a recent childhood cancer survivor, I know from experience the value of the programs provided by Candlelighters. The support and encouragement I received from them helped me get through treatment and stay positive during a really difficult time. It means so much to me that I can now give back to other kids facing similar challenges. I loved helping and seeing all of the people running, having fun, and celebrating one another. It really filled my heart with hope and I look forward to helping out again next year!" Candlelighters for Children with Cancer is the only organization in Oregon and Southwest Washington that supports the entire family, Jones said, including patients, siblings and parents when a child is diagnosed with cancer. The nonprofit offers "programs that bring hope and comfort to families living in the midst — and the aftermath — of a childhood cancer diagnosis." Seventeen-year-old Logan Newman of Ridgefield, Wash., was the first-place male finisher in the 5K, while Keegan Chastain of Portland was the first-place female finisher. Complete race results can be found at candlelightersoregon.org.